The Meduza TITAN, the first fully controllable, lightweight, 3D precision single HD camera with two 1080p CMOS sensors, a solution for 3D television production, will feature a 3ality Technica™ integrated control system, it was announced today by Chris Cary, CEO of the Irvine based Meduza Systems™ Ltd, developer of the TITAN. The Meduza TITAN will debut * at the National Association of Broadcasters (NAB) convention, April 16-19 in Las Vegas. *Booth #C12030. 3ality Technica™, based in Burbank, CA, is the leading 3D technology company that designs, develops and markets the highest level of full 3D technology and systems, including proprietary software. 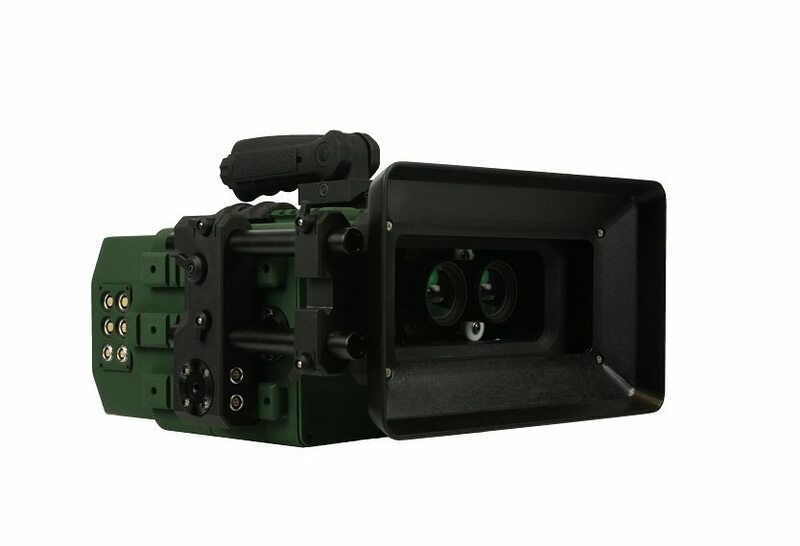 “We are thrilled to help realize Meduza Systems’ idea of complete simplicity in integrating the THC motor drive into their new TITAN 3D lightweight HD camera,” says 3ality Technica SVP Stephen Pizzo. The perfected integrated control system from 3ality Technica provides a plug and play interface that is built directly into the TITAN and will control motorized focus, iris, convergence and IA, either with the 3ality Technica hand controller (THC) connected to the camera body, via wireless transmission, or via Bluetooth from an iPad™ or an iPhone™, using 3Ality Technica’s GUI. Featuring two 1080p CMOS sensors, TITAN is capable of both 1080p and 2k resolution as well as a full range of frame rates, from 24 fps to 60 fps in 10 bit, and has fast, fully motorized inter-axial and convergence, both essential to professional quality S3D film making. Convergence is accurate to 1/1000 of a degree and the inter-axial to 1 micron. At just under 5 kilos (11 lbs. ), the robust and compact TITAN body is crafted from solid pieces of aluminum for lightness, water resistance and durability. The 3ality control capability will allow the TITAN to work as a complete stand alone or fit seamlessly into existing 3ality Technica systems, providing effortless portability. At NAB, Meduza will also feature the Delta 4K S3D Meduza Lenses, the first built for purpose, matched pair, 3D lenses. The lens set has been designed and built to deliver super high precision, not only in the glass, but also in the motorized focus and iris controls. The lenses of the series are not only uniquely optically matched and sold in pairs, but each lens has been constructed to fit into a compact 38mm wide mechanical barrel to allow for very close inter-axial positioning for the Meduza cameras. The lens form factor has been upgraded by Meduza’s Chief Mechanical Engineer Al Mayer to marry with his TITAN camera system design and be more flexible in integrating with other systems. The Meduza Camera System internally incorporates the motor drive unit of the 3ality Technica THC (Technica Hand Controller) for IA, Convergence, Focus, and Iris control. The internal system can be controlled either hard-wired or wireless using the THC hand controllers or an IPAD™ APP readily available. The THC includes an onboard battery mount for Sony’s Info-Lithium rechargeable, as well as a Mico-SD card slot for easy firmware uploads, and convenient capture of the user’s specific parameters. TITAN is priced at $55,000 US and can be ordered with either C mount or the new Meduza mount for the Meduza matched pair prime lens series (Delta 4KS3D). Pre-order customers can expect delivery of the TITAN in July/August. Known as the company who brought the world “U2 3D” in 2007, 3ality Technica is considered the birthplace of the current 3D revolution. Headquartered in Burbank, California, 3ality Technica is the leading innovator, manufacturer, and provider of stereoscopic 3D (S3D) production systems and technology. The company’s product line is comprised of both hardware and software combined to produce the most accurate and advanced image processing systems in the world. These advanced systems are widely used by leading Hollywood filmmakers, the music industry, and by major broadcasters. 2012 will see more 3ality Technica theatrical releases than any other year including the recently released “Underworld 4 Awakenings” and “The Darkest Hour.” Upcoming Hollywood titles that have utilized 3ality Technica’s advanced S3D image systems include “The Hobbit: An Unexpected Journey,” “The Great Gatsby,” “Prometheus,” “The Amazing Spider-Man,” “Jack the Giant Killer,” and “Oz: The Great and Powerful.” Recognized as the industry leader in providing 3D production development and support on a wide array of projects, 3ality Technica is also noted for its amazingly true-to-life 3D image capture for artists such as the Black-eyed Peas, Britney Spears, and Kenny Chesney.